“This is not a pantomime” Chris Bean, director of the Cornley Polytechnic Drama Society yells, whilst the audience retaliate “oh yes it is!” It's not for the most part, well, it's really not trying to be, but this dramatic society must be the unluckiest group in the country – so much so that their attempt at staging J.M. Barrie's Peter Pan is the most pantomime-esque thing I've seen all year. It is pure brilliance. Mischief Theatre have completely and deservedly taken over the West End with their unprecedented successes; The Play That Goes Wrong, The Comedy About a Bank Robbery, and this, Peter Pan Goes Wrong. Actors are playing actors playing characters, and it's a format that works wonderfully well. Posing as the ill-fated Cornley group, all they want to do is present their annual Christmas production. Little do they know that this will be hilariously hindered by a variety of catastrophic mishaps. I love a bit of pre-show kerfuffle. 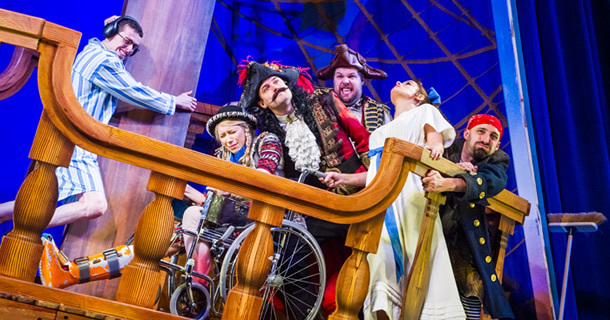 Peter Pan Goes Wrong has plenty of it, setting the scene from the beginning, with members of the cast darting through the auditorium, causing scenes with technical equipment, having arguments and simply being a downright nuisance. Already, the audience know exactly what they are going to get – except the beauty of this production is that it presents surprise after surprise, causing genuine belly-laughter throughout. It's difficult to write without giving too much away, but the various set disasters are outrageously funny, designed by Simon Scullion, from malfunctioning beds to a faulty ship and lights that just won't stay off, all the while positioned on a rotating platform that gets wildly out of control. When Nana gets wedged in the door, there's a brilliant bit with the technicians and Adeline Waby as Mrs Darling, who yells her lullaby over the noise. I was lucky enough to see the same cast I saw in The Play That Goes Wrong, and it was great to see them play the same actors. It’s a terrifically tight ensemble, with marvellous performances across the board. Sydney Smith is hilarious, delivering his lines via some giant headphones which also includes accidentally revealing half of the backstage drama and Matt Cavendish once again captures the heart as the massively endearing Max. Harry Kershaw as the company’s director Chris Bean is tremendously funny, posing as a calamitous Captain Hook. Combining weariness for the company’s misfortune with genuine irritation and some excellent audience ad-libbing, Kershaw delivers plenty of witty one-liners that send the audience into fits. Mischief Theatre have created something magical with plopping slapstick firmly back into the West End. Just when you think they can’t possibly do better, they completely outdo themselves. Peter Pan Goes Wrong is a fantastically festive treat; quick, surprising and really, really funny.